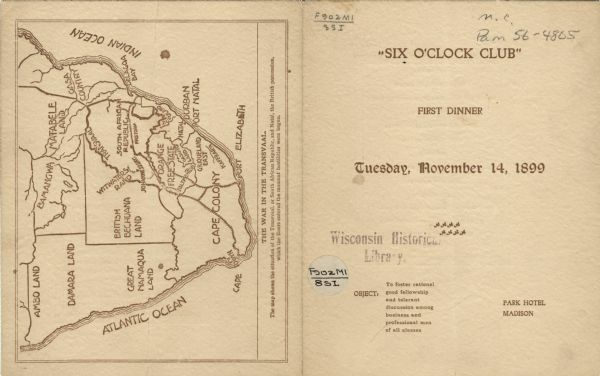 Front and back covers of the first dinner of the Six O'Clock Club held at the Park Hotel, with a map on the back cover of the southern tip of Africa, with the caption, "The War in the Transvaal." The Six O'Clock Club was a men's social and dining club, centered on topics of political and civic interest. For the interior of this menu, see Image ID: 103805. For other Six O'Clock Club Dinner menus, see also Image IDs: 102830, 103636, 103640, 103723, 103782, 103784, 103797, and 103798.